Greg Burke is Opus Dei. Archbishop Vigano is Opus Dei. 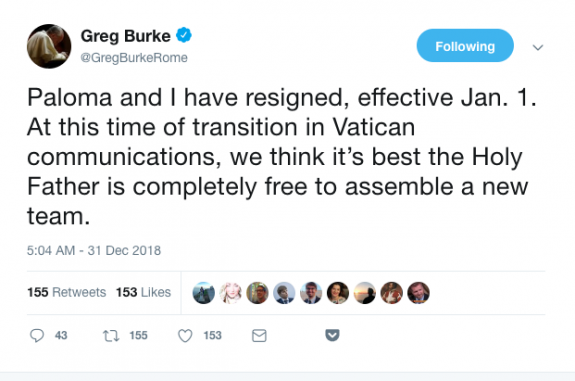 So the Pope took action by removing Opus Dei member Greg Burke as the Holy See Press Office Director. Because Opus Dei member Archbishop Vigano is trying to undermine the Authority of the Pope. Alessandro Gisotti is a professional journalist. He graduated in political science from Rome’s "La Sapienza" University in 1999. He became Deputy Editor-in-Chief at Vatican Radio, where he began working in the year 2000. Among other things, he has followed the activities of the last three Popes, both in Rome and on various international apostolic journeys. He has taught journalism at the Jesuit Maximus Institute in Rome, and “Theories and Techniques of Journalism” at the Pontifical Lateran University. He has written several articles and essays on Church communications, including "The Decalogue of the Good Communicator according to Pope Francis", published in 2016 with a preface by Cardinal Luis Antonio Tagle, Archbishop of Manila. 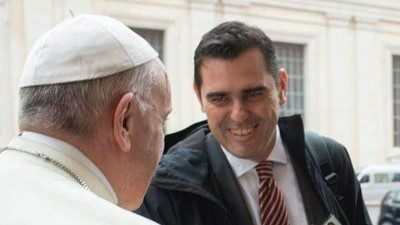 "I have learned of the decision of Greg Burke and Paloma García Ovejero, and the acceptance by Pope Francis of their resignation. In these few months of working together, I have been able to appreciate their professionalism, humanity, and faith. I thank them therefore for the dedication with which they have carried out their work thus far. Today, faced with what is their independent and free choice, I can only respect the decision they have taken. Greg and Paloma (appointed to this task by my predecessor, Msgr. Dario Edoardo Viganò) were the first Director and Deputy Director of the Press Office following the start of the reform of the Holy See's communication system, decided by the Holy Father. 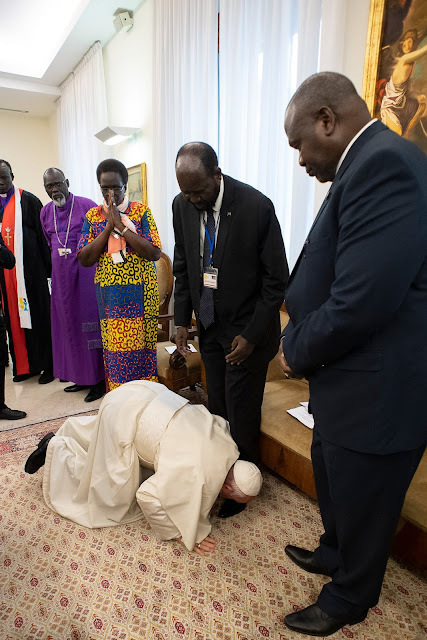 Their significant commitment has contributed to the path of reform that today, according to them, in order to be carried out, requires a rapid hand-over of testimony, in the spirit of service to the Church that we all share. It is precisely with this spirit of service and fidelity to the Holy Father that I myself will carry forward the complex path of this important reform. The year ahead is full of important events that require the greatest effort in communication. I have full confidence that Alessandro Gisotti, until now Social Media Coordinator of the Dicastery for Communication, and former Deputy Editor-in-Chief at Vatican Radio, will be able to guide the Press Office ad interim, waiting for its new structure to be defined as soon as possible".